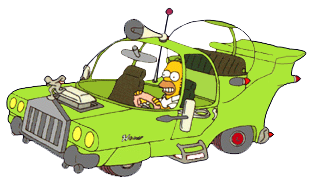 According to Homer, the engine sound causes people to think "the world’s coming to an end." There are three horns, as Homer claims that "you can never find a horn when you’re mad." The three horns play the song "La Cucaracha." Of course, nobody wants such a car and the costs to develop and produce it end up ruining the company which then folds. Which leads me to this: what if Homer designed a guitar? What would a guitar designed by somebody with no aesthetic sensibilities look like? And if Homer said to himself ‘what if I could pack absolutely every little gadget and gizmo I could think of into the guitar’? This entry was posted on September 27, 2011 at 5:50 am and is filed under Uncategorized. You can follow any responses to this entry through the RSS 2.0 feed. You can leave a response, or trackback from your own site. the other party. At their very best they produce moments that make life worth living. Torrent files are unique for the reason that the file itself contains no data with the actual file you want to download. It started with i – Phone and contains now moved to i – Pad 2; the reason- not enough availability. interview with Russo occurred, and usernames are again safe and secure. thus it’s pleasant to read this weblog, and I used to pay a visit this web site every day.